And you are Feifei. Hello! So another year over, Rob! Yes and what a year it's been – and there's just one more thing to do before the next year begins. Party! 是的，新年之际，一定少不了各种庆祝的 party。So are you going to a party, Rob? Yeah, Richard’s invited me to his New Year bash at his house. Everyone's going – apart from you, of course. And I've even invited Zhong. Well, if she goes, there'll be fireworks. The fireworks started when I told her what I really thought about her boyfriend! Err, I'm gonna be late again! The boss is gonna be furious when I get to work. There's gonna be fireworks! There's a public meeting about the new building plans tonight – and there's bound to be fireworks! 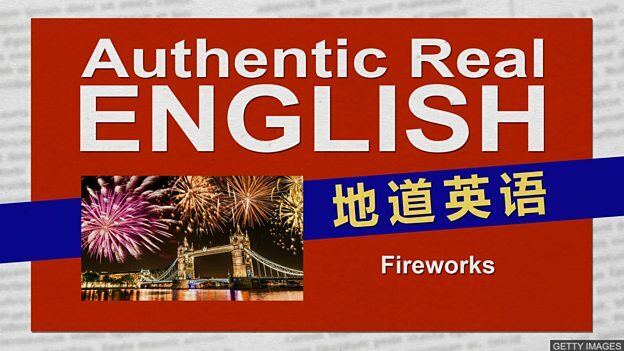 这里是 BBC 英语教学的《地道英语》节目。Rob 要去参加一个新年聚会，这个聚会上虽然少不了 “烟花 fireworks”，但也可能会出现另一种 “fireworks 愤怒的叫喊”。Well, enjoy the party, Rob! Ah, thanks. So why might there be lots of shouting? Well, Zhong is Richard's ex-girlfriend. Their relationship didn't end well. Oh, dear. The situation sounds a bit 'explosive'. Maybe it won't be such a happy New Year. Um, Feifei, what are your plans? So there'll be no angry shouting? Nope. Just cheering and laughter. Sounds great. Maybe I could join you? Err, go on then – as it's New Year's Eve. Great! It looks like our New Year celebrations will go with a bang!